Some Lego builds are impressive, others are awe-inspiring. Flickr user Marshal Banana has spent the last nine months creating a minifigure-scale Lego Sandcrawler. It’s built from scratch, with over 10,000 bricks making up both a beautiful exterior, as well as a fully lit interior. 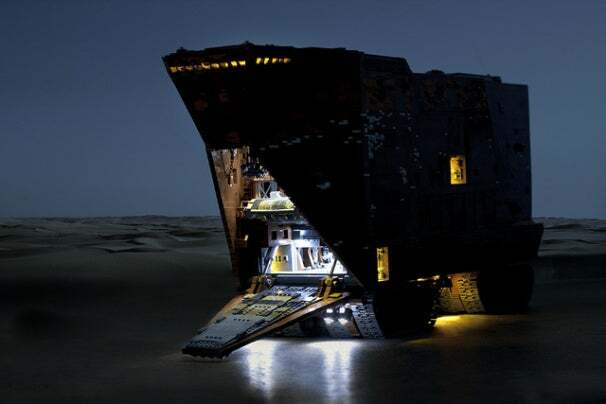 Not content to simply have a really awesome looking replica, the Sandcrawler features a remote-controlled drive system, along with a motorized ramp, working crane, and conveyor belt, which you can see in the video below. The whole thing clocks in at a little over 100 centimeters in length with the front ramp opened, and weighs a whopping 20 kilograms (about 44 pounds). It certainly seems like nine months well spent. Blair Hanley Frank does not want to have a restraining bolt put on.